You know what a submarine is?" asks Armin Bruck. The Managing Director of Siemens in India is not referring to the literal meaning. "When you are a regional company, sometimes you design your own product without telling headquarters. That's what a submarine is," he says. It was one such submarine, designed at the German multinational giant's Goa factory two years ago, with Bruck's quiet encouragement, which brought about a radical shift in Siemens's global focus. Local engineers created an X-ray machine practically on their own, using little of the technology Siemens possessed. The vital difference: this machine is 40 per cent cheaper than the feature-rich, expensive X-ray machines Siemens was already manufacturing. "Once a product is ready, the head office says: 'Okay, we may not like it, but it is here and we have to market it'," says Bruck. The X-ray machine was one of the catalysts that prodded Siemens to address a new market. The company decided it would henceforth give much more attention to the lower- and mid-level technology market it had ignored until then, designing products that were comparatively cheaper than the hi-tech ones it is accustomed to making. So far eight such India-developed products have been launched - among them a new type of steam turbine, a low-end signalling system for the railways, a machine to monitor foetal heart beat - and 56 more are in the pipeline. The signalling system, also developed in India, has been bought by, and is currently being installed in, Malaysia. But Siemens officials are keen to emphasise that these new products are being marketed everywhere - not merely in the emerging markets where price is usually a greater consideration than in developed ones. "A small hospital in a developed economy will find our X-ray machines developed in India equally useful," says Peter Loescher, President and CEO of Siemens AG, the Munich-headquartered parent of Siemens in India (See "India will Play Larger Role in our Operations"). 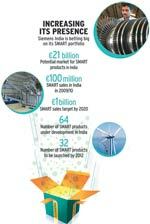 How does India fit into Siemens's global plan? Over the past few years, India's contribution to our global revenues has been steadily rising. The country is in a fast growing mode. We expect India to play an even larger role in our global operations in the future. Siemens has always been known for being an inventor and innovator. Through our deep customer engagements in emerging markets like India, we learnt that a huge untapped potential exists for valuebased products with limited features but uncompromised quality. These products are developed in emerging markets but by no means only attract customers restricted to these. Why has Siemens AG increased its stake in the Indian arm to 75 per cent? We increased the stake because we felt this was necessary to provide us the flexibility to further develop our business in this highly-dynamic market. The new products - labelled SMART, or simple, maintenance-friendly, affordable, reliable and timely-to-market - have been dominating discussions at Siemens AG's annual meetings for the last two years. "At our last annual meeting in Berlin, Peter Loescher asked me to make a presentation about them, which I did," says Bruck. It dawned on the company that this low- and mid-level segment was a vast e 240-billion, or Rs 15.6-trillion (one trillion equals 100,000 crore) market, with the Indian market alone at around e18 to 20 billion. It has also found that many small companies exploit this market to emerge as Siemens's rivals, and the best way of neutralising them was to enter the same market itself. "In the last two years we had a breakthrough. 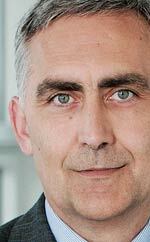 We saw a huge change," adds Bruck. Not everyone is equally gung-ho about the Indian unit's new direction. HSBC's Rahul Garg and Tarun Mukhija, in a research report in August, said the Bombay Stock Exchange-listed company's SMART products were downside risks, warning they could further dilute its margins. Making them cheap and affordable was a prime objective. Though Siemens AG's annual turnover was a staggering $76 billion in 2009/10 - the last financial year for which figures are available, since Siemens follows the October to September cycle - growth was a mere two per cent. In the third quarter ended June 2011, Siemens recorded an operating profit of nine per cent - the lowest in recent times. The Indian arm has performed much better, showing a 24 per cent increase in sales in 2009/10, though here too profits have dipped slightly, mainly because of increased competition in Siemens's mainstay power transmission business. Sunil Mathur, Chief Financial Officer of Siemens in India, strongly disagrees with the HSBC report. "The SMART product portfolio should increase our competitive edge rather than lead to an erosion of margins," he says. "This will increase our penetration into a new market segment enabling us to grow profitably." He points out that Siemens is a zerodebt company and can, thus, use its internal accruals in investing in the Indian market. The company is planning to set up five to six new factories in India to manufacture SMART products and has said it will invest Rs 1,600 crore in India in the next two years. A good deal of preparation, especially in India, has gone into Siemens's 'smart' shift. There have been a clutch of mergers, sell-offs and a hike in stake in the Indian operations by the German parent in the past year. Apart from the BSE-listed Siemens, the company still has another 10-odd firms in different areas. However, Siemens Healthcare Diagnostics and Siemens Rolling Stock, have now been consolidated under Siemens. Those primarily into export - around 15 to 20 per cent of Siemens's earnings come from exports - still remain unlisted subsidiaries of Siemens AG. Siemens has also launched a non-banking financial company, or NBFC, while Siemens AG has increased its stake in Siemens in India to 75 per cent from 55 per cent, with a e1-billion open offer. Will the mergers adversely impact Siemens's earnings per share, or EPS? "We have been successful in maintaining our EPS at constant levels despite the mergers," says Mathur. "Our mergers were carried out with a view to driving profitable growth." So far he is right: Siemens's EPS for the June 2011 quarter was Rs 19.73, while in the same quarter of the previous year it was Rs 17.08. The NBFC arm, called Siemens Financial Services, will primarily finance small companies and entrepreneurs seeking to start up using Siemens products. For instance, Siemens is developing a business model for the foetal heart rate monitor - a small device that can be worn on a belt by a pregnant woman. Siemens Financial will finance doctors or hospitals that may want to buy the machine and then rent it out to women during their pregnancies. But large-scale projects are not ruled out: for instance, Siemens had invested in the new Bangalore airport, though it later sold its stake to GVK. Almost 30 per cent of Siemens's revenues in India come from the renewable energy market. Loescher says the country offers huge potential for wind power solutions, particularly in the low wind segment. "Siemens is gearing up with topnotch high-efficiency wind turbines suitable for low wind conditions," he adds. Among the new factories Siemens is building is a $70-million wind turbine unit in Vadodara, which will be ready by 2012. Finally , Siemens sees great potential in India's growing urbanisation. By 2020, there will be 68 cities in the country with a population of over one million, while existing cities will swell ever further - Mumbai is likely to have a population of 40 million by 2040. "You will need transportation of the future," says Bruck. "You will need affordable mass transportation, power supply solutions, water supply solutions and waste management solutions. Mumbai cannot keep dumping all its sewage in the sea." Globally, Siemens is preparing hard to grab the business opportunities that will arise, for which it has created a new vertical under a new CEO, Roland Busch. The company is executing major contracts in India to provide coaches, tracks or electrification with suburban and metro rail authorities in Mumbai, Delhi, Kolkata, and Chennai. For Bruck, who has been in the country since 2007, Indian cities - and especially Mumbai - mean much more than mere business. He has grown to love Mumbai, delighting in particular in the ferry ride across the Arabian Sea to the Elephanta Caves nearby. He has taken his family of six to the caves at least 10 times so far. It pleased him no end when his eldest son Nicolas recently declared that Mumbai was the city of his dreams. "India will be a major hub for design, development and production of low-frills products customised to local needs," he says. Can BSE succeed with SME bourse?